Intracranial aneurysms are malformations of cerebral arteries that are typically saclike in shape and occur close to vessel bifurcations, see Fig. 1. Aneurysms indicate a region on the arterial wall with an increased risk of rupture, which is a dangerous event for the patient and may lead to permanent brain damage or death. 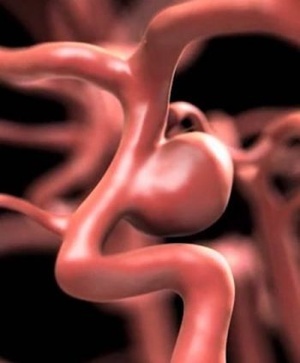 Intracranial aneurysms are prevalent, roughly 3-5% of the population is affected, but the annual rupture risk of an aneurysm is below 1% in average, which makes the clinical decision-making (whether to treat an aneurysm or not) a difficult task. As they normally do not cause any symptoms, unruptured intracranial aneurysms are diagnosed incidentally. They can be identified in so-called angiographies where the brain vasculature is contrasted from other brain tissues. If clinicians were equipped with a tool that helps them to assess the status of an aneurysm or to match its morphological characteristics with those registered in a database, clinical risk assessment could be considerably improved. This semester or master project will be about the robust segmentation and/or isolation of intracranial aneurysms for different imaging modalities (CTA, MRA and 3DRA) and how their shape characteristics depend on aspects like resolution, contrast or the presence of imaging artifacts. The student will get the chance to deal with state of the art techniques in medical imaging, computer vision and machine learning with focus on vessel segmentation and aneurysmal shape extraction. The contributions within the scope of this thesis potentially have a large impact because a clear notion of the amount of information that can be extracted from imaging data is key for introducing novel imaging-driven methods for disease assessment into clinical practice. The detailed scope of the project can be matched with the interests and expertise of the candidate at the beginning of the project. A good understanding of computer vision and coding skills are mandatory however. Ambitious students will get the possibility to work on a publication. A rich set of clinical imaging data is already available. The thesis will contribute to the AneuX project and will be conducted in an interdisciplinary setting in collaboration with clinicians at the University Hospital of Geneva and the Hirslanden Clinic in Zurich. The student will be offered the chance to get insights into clinical practice as well.